California Representative Eric Swalwell, a great example for all of us the idiocy of the left has shown us time after time the idiocy of the left. But he is not alone; you have none stop crying and bellyaching over something Trump said from the left because they can’t complain about the job he is doing. With the economy roaring, our unemployment dropping, thus driving up wages as employers compete from a smaller pool of available people, our economic growth is almost double now what it was under Obama, much of this due to the lifting of oppressive regulations from Obama and others before Trump took office. With the manufacturing outlook up, employer confidence level as well, we are starting to see the same thing from consumers, you now have some Democrats pining for the economy to collapse, at least that may aid them in getting rid of Trump. While all of this has happened, the brain-dead leader from California, Rep. Eric Swalwell has stood in the forefront and kept up his claims that if you support Trump, you must be supporting Putin or worse; you are endangering national security by questioning claims of Trump collusion. I found it interesting in an interview with Tucker over congress and foreign influence, how the Congress demands that others give up information on meeting with foreign agents, but they don’t all he could do was continue to change the subject, refused to address the double standards we see from the left today. 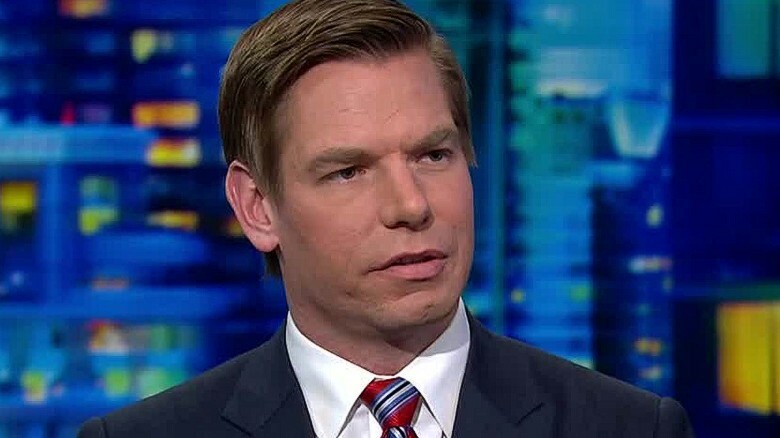 We have seen this further as he has made his rounds at liberal media sites to back up the party line, seems what we have is Rep. Eric Swalwell is nothing but the Democratic lap dog, running around running interference for them as he tots the party line. What is more, his constant rants over the Russian Collusion with Trump, even though to date there has never been one shred of evincing to support this, he will not give up on this fantasy line of thought. In this video you have him suggesting that classified intel in 2017 suggested Trump collusion, yet with all the evidence released to date has never shown a shred of collusion. This is still something that not only Congress refuses to give up on, but something the press is still hanging on to for all they are worth. This outrage has grown more as Trump has dared to say that he was not in agreement with intel’s findings, to claim such a thing was seen by the left as treasonous, to dare to question the group that missed out on 9/11, WMD’s in Iraq, the Iranian revolution, is now supposed to be above reproach, how dare anyone question them, according to this it makes anyone that dares to question what the intel apparatus, one that was totally politicized by the Obama administration, is now seen as unthinkable, to do so is to show signs of treason. This is the new depth of stupidity both the left and the GOP deep state players have gone to. While Trump did say he trust the intel now, I sure don’t; there are too many politicized people within it, that seem to be putting their political views before what is needed, good intel, instead, they change, manipulate the intel handed forward to laced with their political agenda. I am beginning to feel as we go on further, as the left sees their hope in taking the elections they get more and more desperate in their attacks against Trump, now we have officials calling for violence, sadly people like Rep. Eric Swalwell leading the way, parroting what his leftist bosses are demanding he say. What worries me more, I wrote that we were on the path to a civil war, violence could come if the Left loses the 2020 election, they could resort to violence to try to take what they could not take with the vote. I am sadly starting to think my assessment of this was wrong, I am now seeing calls of violence, coups by the left now going on now, seems they are now running towards a confrontation, the question I ask, is anyone going to stop this, or will leaders like Rep. Eric Swalwell who put the party line over facts continue to read this headrush towards a conflict. NextJudge Jeanine Pirro Drives Whoopi To Expose Her Trump Derangement Syndrome. Al Sharpton, A Visionary Or A Racist Hater, A Good Shepard Or A Wolf In Sheep’s Clothing?